Tijuana, Mexico – Nubia Morazan looked after her one-year-old son as he played outside their tent propped up beneath a freeway overpass just inches from Tijuana car traffic. It’s been more than 24 hours since Morazan has had a bite to eat, and she is willing to go days more without food if it helps draw attention to the plight of migrants and refugees waiting at the US-Mexico border. 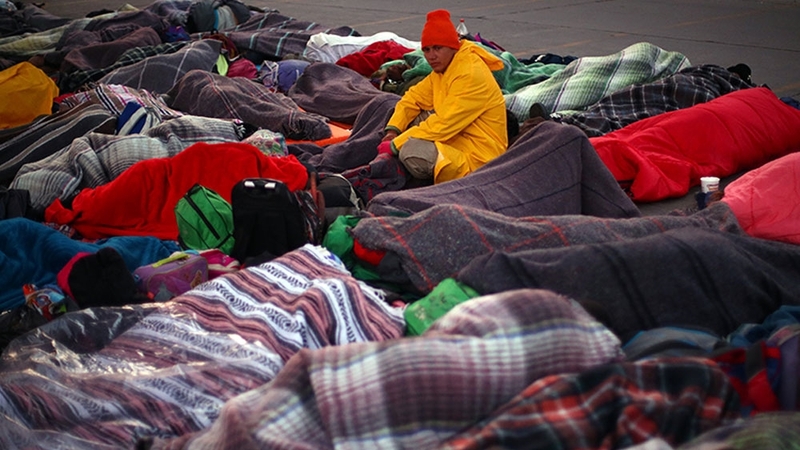 Morazan is one of more than a dozen refugees and activists who started a hunger strike last week to pressure US immigration officials to speed up the asylum process that is expected to require most of the more than 6,000 Central Americans, who arrived in in Tijuana as part of a mass exodus, to wait at least two months to apply for asylum. The hunger strikers are also calling on the Mexican government to provide work visas while the migrants and refugees wait. “We need the process to be faster, because we don’t have a place to live,” Morazan says. “This is a difficult environment for the children here in Tijuana. What we want is to be somewhere where they can study and have a better future,” she told Al Jazeera as her two children, who eat regularly while they join their parents in an encampment just feet from the pedestrian border crossing called the Chaparral. Rights groups have accused the Trump administration of intentionally stalling the asylum process to try to deter individuals from attempting to come to the US, allegations the government denies. Last month US President Donald Trump suspended asylum rights for immigrants who try to cross into the US between official ports of entry. A federal judge temporarily blocked the new rules pending a challenge in court. Additional practices, including metering, the US government’s practice of regulating how many people can enter the US to seek asylum, have pushed migrants and refugees like Morazan to take more extreme measures to try to speed up the process. “We can’t afford to wait considering the circumstances,” said Irineo Mujica, an activist from Tijuana during a press conference kicking off the hunger strike last Thursday. “The hunger strike is a peaceful action to ask for help,” he said. Morazan said she’s number 1,592 in the list of 5,000 asylum-seekers. From Honduras, she joined the migrant caravan in mid-October, escaping a violent ex-husband. “He beat me and treated be horribly. When I left him and met the father of my young son, his friends would call and threaten me,” she said. After moving multiple times she says her ex-husband and his fellow gang members still found her and her family. They fled to San Pedro Sula and heard about the caravan. “It happened so quickly. The fact is, we also are fleeing poverty. My husband made so little in Honduras and it wasn’t enough to raise our two children,” she said. Sammy Contreras, 23, from San Pedro Sula, Honduras, has been on hunger strike for three days. He said while local residents have left them alone for the most part, the group takes turn keeping watch over night. 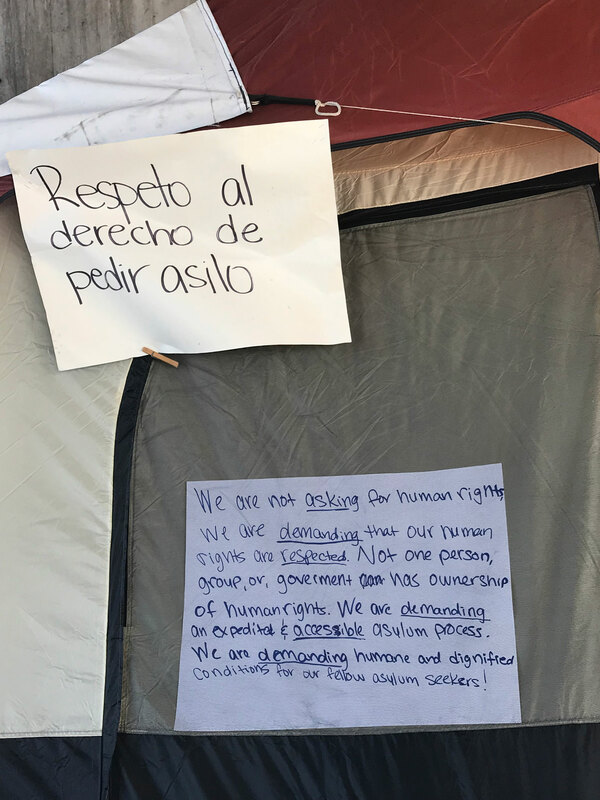 The camp hasn’t received a response from the US and Mexican authorities which frustrates Contreras because as asylum-seekers “what they need most is a response and options”. My dream is to enter the US. It’s the dream of many people here. Tijuana’s Government Secretary Leopoldo Guerrero told Al Jazeera that the city was aware of the hunger strike but said the local government also wanted the US to clarify how long migrants and refugees had to wait for asylum. After travelling more than 3,200km from Honduras, and less than half-way through her hunger strike, she’s steadfast in her determination to reach the US. “My dream is to enter the US. It’s the dream of many people here,” she said.